Do you love “rugged luxury”? Do you love a big, bold SUV that’s just begging you to pack the kids into the backseat and hit the dusty road, and by “dusty road” a mean “a mall parking lot”? Do you love buying American-built vehicles? Then the 2020 Telluride—Kia’s largest vehicle yet—might just be the perfect SUV for you. And this time, you can actually purchase it. This eight-seat SUV boasts space and comfort for everyone who sits inside it—including the poor souls who get relegated to the third row. 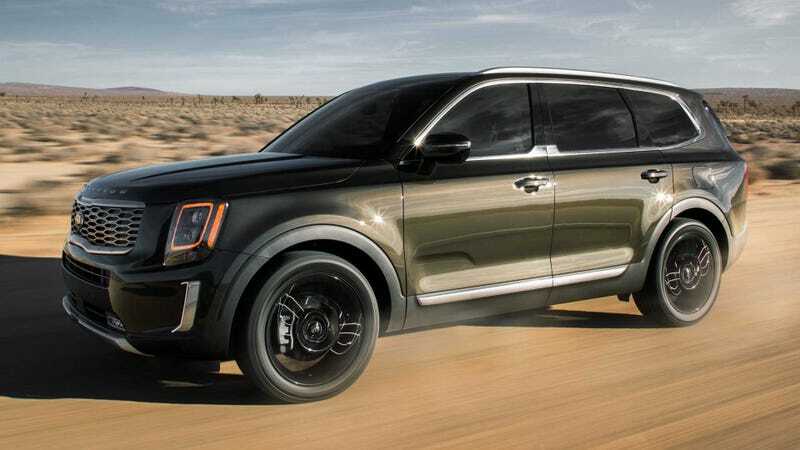 With all-wheel drive and a 291 horsepower 3.8-liter V6 engine, Kia is marketing this big boy to all the folks out there who are looking for their drive to be smooth, whether they’re taking the kids to school or rumbling through the desert. The Telluride has four regular drive modes—Smart, Eco, Sport, and Comfort—along with Snow and AWD Lock modes, so the driver has plenty of control over their ride. Yes, the driver can also mess around with a 10.25-inch touchscreen and can enjoy a heads-up display. And with six USB charging ports, everyone should be able to enjoy their off-road adventures with a full charge. For those of you concerned about the safety of your family, never fear: there’s plenty of tech in this car to make sure everyone will be okay in the event of an emergency. Some are standard, some are available for an extra cost, but the most important are seven airbags, blind spot and lane departure warnings, lane keeping assists, and collision warnings. Maybe most interesting, though, is a feature called called Rear Occupant Alert, a safety feature that gives drivers an audible warning if there’s movement in the backseat after they’ve exited and locked the car. The 2020 Telluride will go on sale next year in four trims: LX, EX, S, and SX. There’s no word on pricing yet, but keep an eye out—it should be announced closer to the SUV’s release date.